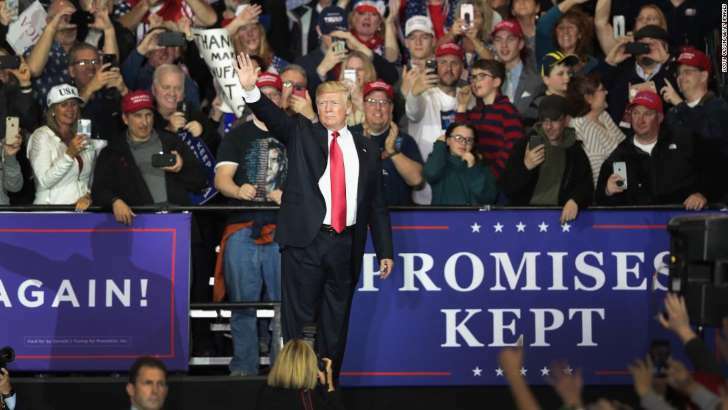 On Saturday night, even as comedian Michelle Wolf was roasting him in Washington, President Donald Trump was in another Washington -- this one in Michigan -- where he was delivering a roast all his own: Of elites, the media, Democrats and anyone else he could think of. I went through the transcript of Trump's Michigan speech and picked out the most eye-catching lines. They're below. 1. "You want to see a lot of people? Go outside. We could have filled this place up five or six times." Heeeeeeeeere's Donald! And, yes, within 20 seconds of taking the stage, Trump was talking about how the crowd was huge -- and could have been far bigger. 2. "I said, couldn't you have gotten one larger? That would've been nice." Reminder: LOTS of people are there but even MORE wanted to be there. Why didn't these Michigan people think of that??? 3. "Where is Bill? Where? All right. Wherever the hell he is." Trump is looking, unsuccessfully, for Michigan Attorney General Bill Schuette. Wherever the hell he is. 4. "I wish you could have given us a larger arena but what are you going to do?" For the third time in his first few minutes on stage, Trump is talking about the size if the crowd -- and why it could have been much bigger. Big is good. Bigger is better. His calculus isn't more complicated than that. 5. "They said, 'Donald Trump has won the state of Michigan' -- won the state of Michigan. And we won a lot of other states also. That was some night." The 2016 election ended 536 days before Trump took the stage Saturday night. As you may have heard, he won. And he carried Michigan. No one said he could do it. But he did. 6. "We are appointing judges like never before. Great conservative, Republican judges. We're setting records. By the time we finish, I think we will have the all-time record." There's no doubt that Trump is appointing lots and lots of judges. As for "setting records," he appointed 12 federal circuit court judges in 2017 alone, the most ever. Also, never forget how much doing things other presidents haven't done is to Trump. Setting records for crowd size, for appointing judges, for getting tax cuts through -- this is his lifeblood. 7. "We have the worst laws anywhere in the world." ... Says the President of the United States. 8. "We don't have borders." 9. "I said, 'Let's not do it there. Let's let them put pressure on Gov. Jerry Brown. Moonbeam.'" So: Trump says San Diego is begging for the wall. And the money for it has been secured. But that maybe he won't do it to force a political opponent to feel some pain. So, OK.
10. "I can't pay the extras. I hate extras." 11. "Big areas don't want sanctuary cities. They want to be safe. They don't want them. We had to fund our military. Our military was depleted." This is not edited. These sentences followed directly on one another. Stream. Of. Consciousness. 12. "We are ordering brand-new airplanes. Brand-new everything." I wonder if new airplanes have a "new airplane" smell. I love that smell. 13. "Mad dog Mattis could not be happier. Cannot be happier." I maintain that if James Mattis's nickname was "Short Stuff," Trump doesn't choose him for secretary of defense. "Mad Dog" is the sort of stuff that Trump likes. It's tough-sounding. 14. "The Democrats don't care about our military. They don't. They don't care about our borders or crime." Yes, this is a campaign rally. But, even for campaign rhetoric this runs pretty, pretty hot. Democrats don't care about the military or the border or crime? Really? 15. "You people just keep putting her back against him again -- again and again. It is your fault." Trump is referring to Sen. Debbie Stabenow here. And, a line like this is a reminder of his uniqueness as a politician: Scolding people at his rally for voting for her! 16. "We are doing things that are good." I like good things. And doing good things. 18. "They were saying, 'What you think President Trump had to do with it?' I will do you what. How about, everything -- I will tell you what. How about, everything?" Nothing irks Trump more than not getting full credit for things he believes he deserves full credit for -- which is all things. He's specifically referencing the talks between North Korea and South Korea over the past week. 19. "I know things about the senator I can say, too. If I said them, he would never be elected again." Trump is insinuating he has dirt on Sen. Jon Tester that would destroy the Montana Democrat's career. Does he actually have that dirt? Count me as very, very skeptical. 19. "A woman lawyer, she said, 'I know nothing.' Now, she supposedly -- you know why? Putin and the group said, 'Trump is killing us. Why don't you say you are involved with government so that we can go and make their life in the United States even more chaotic?'" OK, stick with me here as we trace Trump's logic. The "woman lawyer" in question is Natalia Veselnitskaya, who met with Donald Trump Jr and other top campaign officials at Trump Tower in the summer of 2016 -- promising dirt on Hillary Clinton. Although Veselnitskaya denied at the time that she had any ties to the Russian government, she has now acknowledged ties to the country's legal office. That admission, according to Trump, is because Russian President Vladimir Putin thinks Trump is being so hard on Russia that the only way to relieve pressure is to get Veselnitskaya to say she worked with the Russian government. 20. "Look at how these politicians have fallen for this job." This is classic Trump. No one sees the conspiracy theory except him and the people in the room where he is speaking. All of these politicians don't see it. But he sees it. 21. "The only collusion is the Democrats colluding with the Russians, the Democrats colluding with lots of other people." NO COLLUSION! YOU'RE THE COLLUSION! 22. "Comey, how about this guy Comey?" I've often compared Trump to a comedian -- setting up his lines and priming his audience. This is perfect example. "What's the deal with this weather, amirite?" 23. "They start something based on a document that was paid for by the DNC and Hillary Clinton." For the billionth time: The FBI investigation, which became the special counsel's investigation, was not launched because of the Steele dossier. Multiple intelligence officials have made this clear -- over and over again. Also, we know for a fact that the FBI investigation was launched in July 2016 because of information regarding Trump foreign policy adviser George Papadopoulos bragging to an Australian official that the Russians had dirt on Hillary Clinton. 24. "They did that to Admiral Jackson. They are doing it for a lot of people." b) What "lot of people" are we talking about? 25. "In the old days, when the newspapers used to write, they would (put) names down. Today they say, sources have said that President Trump -- sources. They never say who the source is." Anonymous sources have existed since the start of journalism. 26. "They don't have sources. The sources don't exist in many cases. The sources in many cases don't exist." This is simply not true. Every mainstream media organization has a rigorous process to ensure not only that their sources exist but that the sources are in position to know of what they speak. 27. "You remember Jon Lovitz? A liar. Comey's worse. He is a liar and a leaker." 28. "I did you a great favor when I fired this guy. I'll tell you. I did you a great favor." What can I say except you're welcome!! 29. "What about the guy who took $700,000 for his wife's campaign. Nobody even talks about. Nobody even talks about it." A total and complete distortion of facts. Trump is referencing former deputy FBI Director Andrew McCabe, whose wife ran for the Virginia state Senate in 2015. Then-Virginia Gov. Terry McAuliffe moved several hundred thousand dollars via an allied super PAC. Andrew McCabe never received any of the money -- as Trump, of course, knows. 30. "Ultimately, I love my farmers." Look, at the end of the day, it it what it is. Also, farmers! 31. "Long-term, you are going to be so happy." Short-term and medium-term would like a word. 32. "Chrysler is moving back to Michigan from Mexico." 33. "Cars are coming back to Michigan." Auto manufacturing employment numbers dropped in 2017. 34. "Six years ago, I wasn't even running. The Republican of the year award. Maybe they knew what was going to happen." Trump has claimed to have won this award before. It's not obvious a) he won it or b) it exists at all. 35. "Nobody in the first year of office has done what we have done." It's very, very hard to fact-check this claim given that we don't know what metric Trump is using to measure having done more than anyone ever. But, by virtually any metric, it's not true. 36. "After years of rebuilding other countries, we are finally going to rebuild our country." I actually think this is one of Trump's best lines of the speech -- and his presidency. If he just focused on rebuilding infrastructure and reinvesting in America, this presidency could look very different. 37. "We have spent 7 trillion dollars in the Middle East." 38. "We have a great site that we are going to buy. The best site." He's talking about the site of the planned US embassy in Jerusalem. And, yes, of course it is the best site in all of Israel. 39. "Now, as you know, in the UK, in London, we have the best site in all of London. The best site." The best site. In every city. And on every planet. 40. "We are at the top of the charts. And they are talking about it all over the world." The top of the pops. The highest heights. The summit. The acme. Everyone is talking about it. 41. "Our laws are so corrupt and so stupid -- I call them the dumbest immigration laws anywhere on Earth." 42. "And the laws are so corrupt, they are so corrupt"
43. "If we don't get border security, we'll have no choice. We'll close down the country." Trump threatens that unless he gets full funding for the border wall this fall, he will force a government shutdown. Mark that down. 44. "Be careful of your 2nd Amendment. OK, be careful. Be careful of your 2nd Amendment if they get in." Trump regularly floats this idea that Democrats, if they gain control of Congress, will work to abolish the 2nd Amendment. There's absolutely no evidence to suggest that a) is something Democrats would try to do and b) that they could possibly do it legislatively even if they wanted to. 45. "Michigan had not been won in many years." Five hundred and thirty-six days since the 2016 election. Also, Trump was first Republican to win Michigan since George H.W. Bush in 1988. 46. "There were 32,000 people. I finished speaking at 1:00 in the morning on Election Day. Thirty-two thousand people." The rally Trump is talking about was in Grand Rapids on the night before/early morning of Election Day. There were 4,200 people there. Not 32,000. 47. "We have to win the House. We are going to win the House." 48. "We are not the patsies anymore." 49. "We are getting rid of Obamacare. Some people would say that we have essentially gotten rid of it." 50. "And nobody knows what a community college is." 51. "Not come in based on some random lottery system." [narrator voice] It's not a random lottery system. 52. "It is all happening." I know it wasn't, but I am going to tell myself Trump made a purposeful Ron Paul meme reference. 53. "We will have crystal clean water. We will have beautiful, clean air. We will be great." 54. "When the President of France came in to see me, President Macron, wonderful guy. We like to shake each other's hand." 55. "Mars is waiting for us." Remember that last month, Trump said this: "Very soon we are going to Mars. You wouldn't have been going to Mars if my opponent won, that I can tell you. You wouldn't even be thinking about it. Wouldn't be thinking about it." Hillary Clinton was very anti-Mars. Everyone is saying it. 56. "They hate your guts." Trump is talking about the media here. And, no, the media doesn't "hate your guts." And Donald Trump knows it. 57. "We are higher now than we were on Election Day. We are higher now."